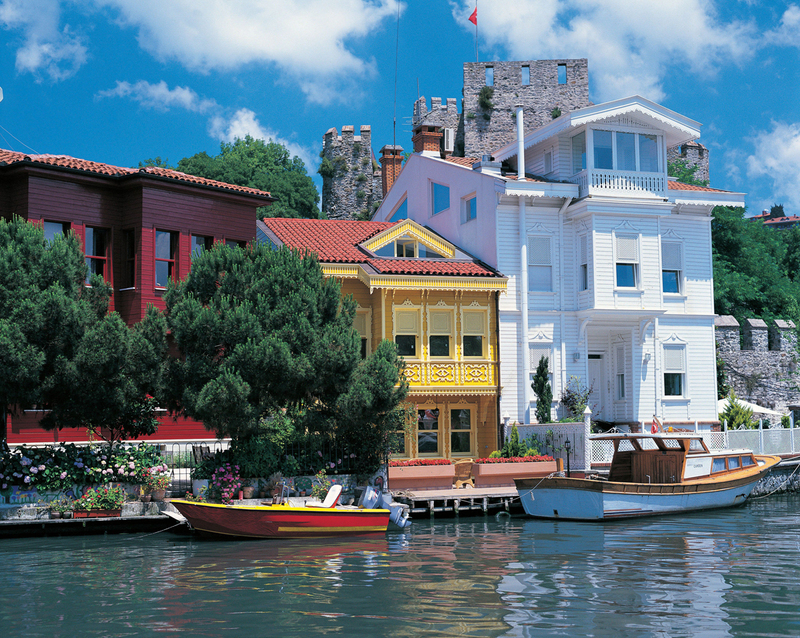 sIstanbul has long been a lure for travellers in pursuit of the exotic, the city where Europe and Asia meet in harmony yet where the whiff of an alien culture is obvious. Just over a hundred years ago, it was as far as the sensible person on the Grand Tour would venture and it was the stopping place for that most exotic form of transport in those days, the Orient Express. It was where Christians met Muslims, a city of fewer than a million people, the city with a well-preserved heritage from Byzantine churches to Ottoman palaces. 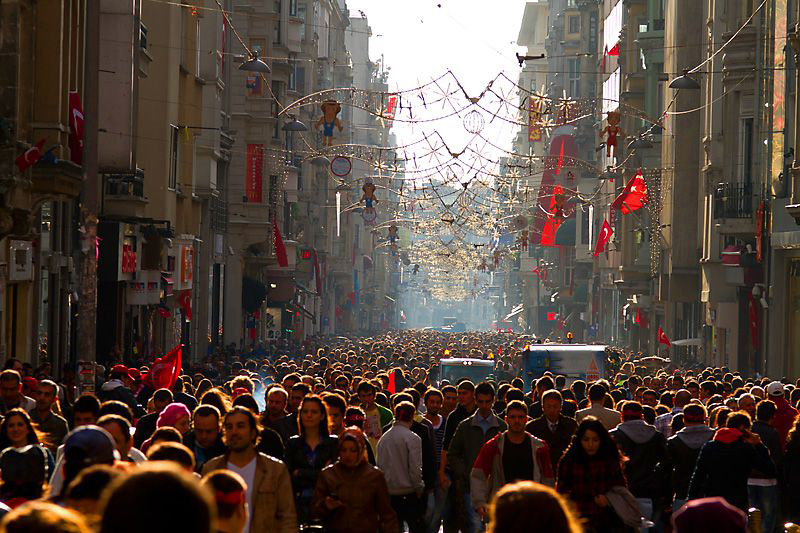 Today’s world travellers venture much further in their quest for exciting destinations but Istanbul still manages to stir the senses. This derives from many things, from the faces of its citizens who hail from many regions of the country and on whose faces is written the country’s history, the magnificent architecture ranging from early 5th century to present day designs in glass and steel, and from the mosques and churches with their mosaics and fine carpets that point to the continuity of the two cultures side by side. If you have only one day there, perhaps on a cruise ship, then the two most important sights are the Aya Sofia and the Blue Mosque. But if you have longer, than take a boat cruise on the Bosphorus and have a fish sandwich at the end of it (fresh fish from the Bosphorus fried on board and slapped between two pieces of bread). The following places should be included in your tour. A magnificent underground reservoir with 336 columns each one 9m high beneath a high vaulted ceiling. Visitors walk through this forest of pillars on raised wooden boards above carp-filled waters which reflect the columns. It was built in the 4th century during the reign of Constantine the Great and creates an impressive atmosphere. Topkapi is the largest and oldest palace in the world to survive until today. 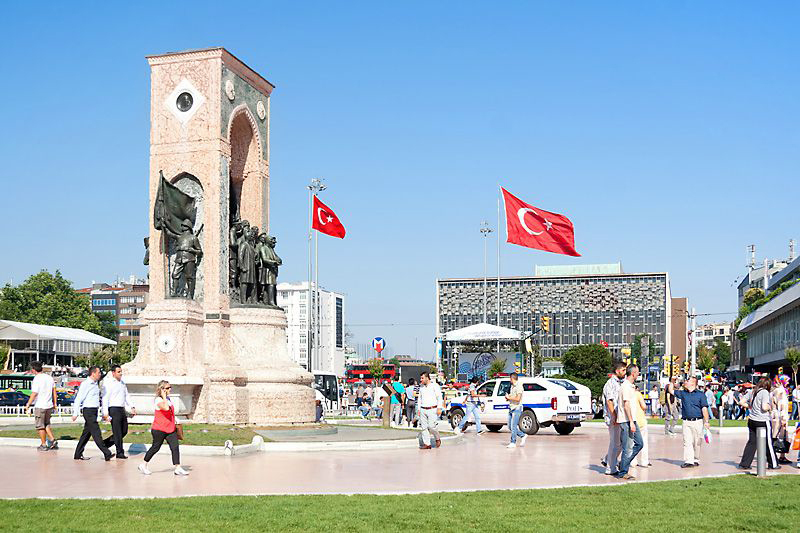 Situated on the site of the first settlement in Istanbul, it commands an impressive view of the Golden Horn, the Bosphorus and the Sea of Marmara. Once home to the Ottaman Empire’s ruling sultans from the mid 15th century to the mid 19th century this sprawling palace was turned into a museum on orders from Ataturk in 1924. Inside it consists of richly decorated chambers, pavilions overlooking the Bosphorus which were part of the private world of the harem, and holds some of the fantastic diamonds and other jewels of the Court. Most famous of these is the Topkapi emerald-encrusted dagger. Television still shows the Jules Dassin film of the same name, Topkapi, starring Melina Mercouri, Peter Ustinov, Maximilian Schell, and Robert Morley which was about the attempted theft of this famous emerald. If you have never seen it, catch it next time it is screened: it is well worth watching. 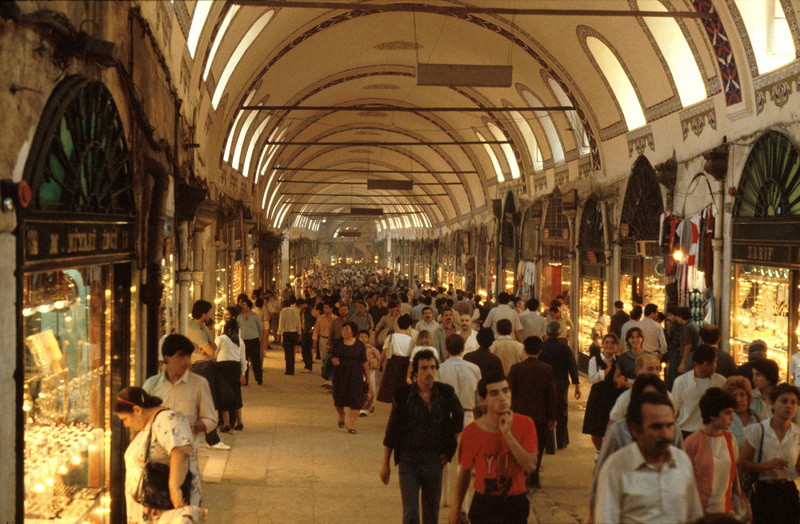 Said to have been founded by Istanbul’s first Ottaman ruler, Mehmet ll, the Grand Bazaar is one of the most famous souks in the world. It is a town within a city, miles of alleyways lined with over 4,000 shops which makes it an easy place in which to get lost. Everything from jewellry and carpets to Turkish delight and fake handbags is for sale here. The salesmen are experts at their job and you need to be firm if you don’t want to buy a silk carpet (which they can ship home for you) or a rug or a kelim. Caveat Emptor. Its real name is the Sultan Ahmed Mosque but everyone knows it now as The Blue Mosque, the only one ever to be built with six minarets. One of the most famous monuments of Turkish and Islamic art it is a fine example of classical Turkish architecture. The architect, Mahmet Aga decorated the interior in jewel-like colours and it features stained glass, marble latticework and thousands of beautiful blue tiles which give it its name. It was built in the early 17th century and was originally part of a larger complex of baths, public kitchens, a covered bazaar, a hospital, schools and a caravanserai, few of which survive today. 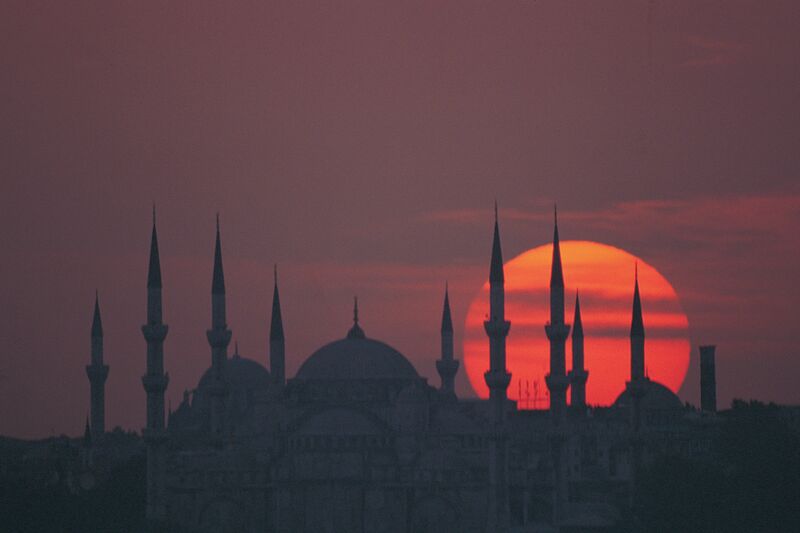 If at all possible, try to view the mosque from the sea when, dominating the Old City skyline, it is breathtaking. The Byzantine Emperor, Justinian, was responsible for the commissioning of this Christian church in 532 AD, the crowning glory in Christiandom’s crown for a millenium. Under the Ottamans it became a mosque but it is now a museum, famous for the seemingly unsupported vast dome of golden mosaics and stained glass windows. 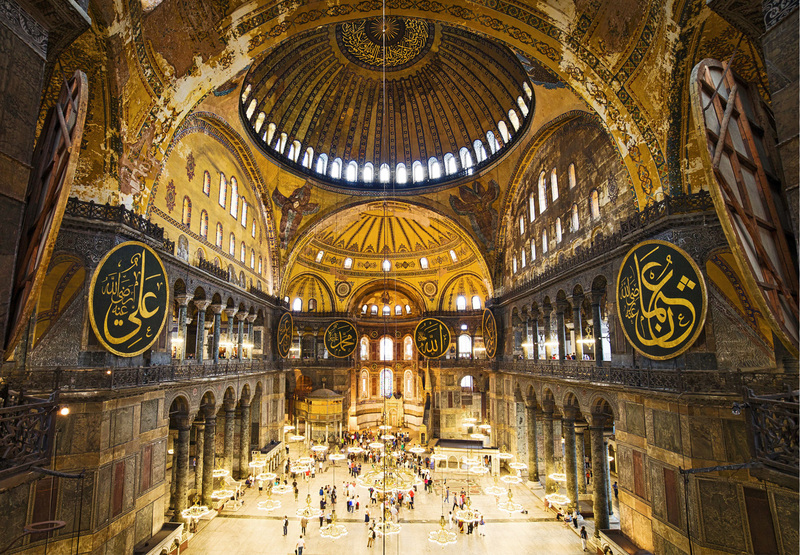 Aya Sofia (or Hagia Sofya or Haga Sofia) is one of the most visited Museums in the world. Used as a Christian church for 916 years, it was converted into a mosque after the conquest of Istanbul by Fatih Sultan Mehmed and remained so for 482 years. In 1935, a decision by Kemal Atatürk and the Council of Ministers, meant that Hagia Sophia was converted into a museum, which it remains to this day. Hagia Sophia is open for visit every day except Mondays.